Acquired: Signed on May 28, 2017. Colquhoun was selected in the 2016 CFL Draft by the Eskimos. 2018: In five games (two starts), Colquhoun finished with six defensive tackles and two special teams tackles. 2017: In 9 games (nine starts), the 2016-draft-pick Colquhoun finished with 26 defensive tackles and Colquhoun also recorded his first-CFL interception in Week Six against the BC Lions. In the West Semi-Final, Colquhoun recorded eight tackles. 2016: Selected by Edmonton in the second round (16th overall) of the CFL Draft. Pro: Spent the 2016 season with the Dallas Cowboys. 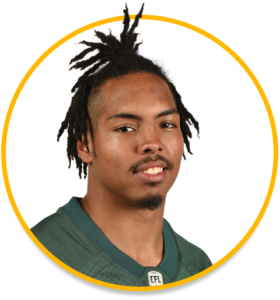 College: Colquhoun attended Michigan State University from 2011 – 2015 and recorded 62 tackles, one sack and three interceptions in 40 career games.